BANGKOK — Thailand’s junta leader looks set to return as prime minister after a general election stacked heavily in his favor, but the process reveals that more than a decade’s polarization in Thai politics is as strong as ever. Rather than ensuring stability, the sharply divided vote almost guarantees new struggles over power, which could involve parliament, street protests or even fresh military intervention. A self-declared “democratic front” of seven political parties says a preliminary vote count from the March 24 election shows it will be able to put together a majority in the House of Representatives. But the junta-appointed Senate also takes part in the vote for prime minister, meaning junta leader and Prime Minister Prayuth Chan-ocha will likely need to win only one-quarter of the elected representatives in the lower house to get his job back. Prayuth as army commander led the 2014 coup that toppled an elected government, and many people would see his taking power again through a carefully manipulated process as just the latest instance of Thai voters having their choices overruled by legal or extralegal means. It would still be far from smooth sailing even if Prayuth and his allies in the Palang Pracharath party form a government, while the anti-junta coalition led by the Pheu Thai party holds a majority in the House of Representatives. With the final election results not being certified until May 9, there’s a good chance the numbers — perhaps whittled down by disqualifications — will not give the anti-junta coalition a majority. 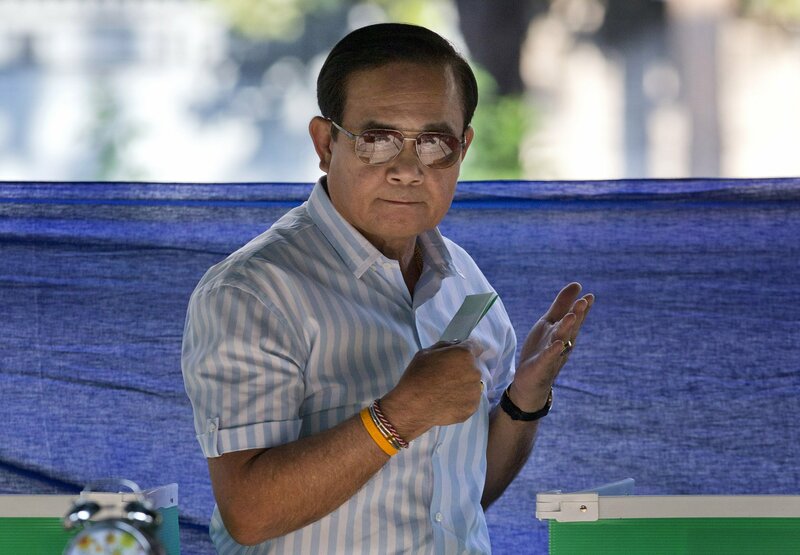 But this runs the risk of appearing that the junta-friendly Election Commission is helping to steal the election, creating a public backlash and the possibility of street protests. “If they go the nuclear option and get rid of one of the parties, entirely dissolve them, then I think you may see people getting really, really, really upset,” said Kevin Hewison, a professor emeritus at the University of North Carolina and veteran Thai studies scholar. In the worst-case scenario, the failure to establish a working government could invite new intervention by the military. The army’s excuse for staging its coup in 2014 was to end political strife that deadlocked the country’s administration. Aside from the maneuvering to form a new government, the vote showed that what Thailand’s people want is not uniform and perhaps not even clear after nearly half a decade in which political activities were banned and freedoms of speech and assembly were severely restricted. The preliminary results of the election, though marred by alleged irregularities, paint the picture of a nation deeply divided between those for and against military rule. Of course divisions are nothing new in Thailand. The country’s politics have been defined by them since the rise of former Prime Minister Thaksin Shinawatra, a telecommunications tycoon who came to power in a populist political revolution nearly two decades ago. Thaksin was beloved by many in the countryside for policies such as universal health care and farm subsidies, but was loathed by many in the country’s conservative establishment who saw him as corrupt and a threat to the traditional role of the monarchy at the center of Thai society. He was ousted by a 2006 coup and is now in exile. But the dominating factor of Thaksin as boogeyman may be fading, with the rise of what some analysts see as a third force, the Future Forward Party, which starting from scratch without the benefit of old-school politicians in its leadership managed to pull off a third-place finish in the polls, both in terms of popular vote and likely seat total. The party has a youth-oriented appeal but also a frank anti-military stance, and as more or less amateurs, stands apart from the other major contenders. Part of the party’s appeal is that it has given those opposed to both military rule and Thaksin a path to express themselves. The anti-Thaksin forces may still see the battle as one against the former prime minister and his political machine, but others such as the Future Forward Party and Pheu Thai are trying to move it toward a pro-democracy versus anti-democracy dialogue, said Jacob Ricks, a political scientist at Singapore Management University. “Thaksin is appearing less important in their discussion, while he remains front and center for the military and their allies,” he said. Montesano said one of the upsides of the election is that divides in Thailand are no longer so much about Thaksin. “The downside may be that voter sympathy for or patience with a continuing authoritarian orientation toward politics has become evident,” he said.